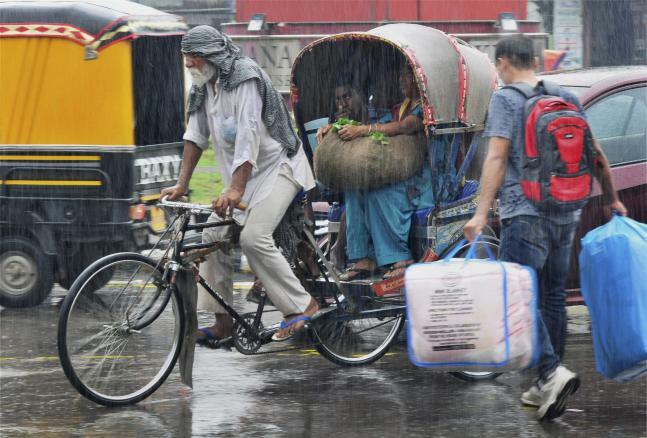 Rains pounded several parts of north India throwing life out of gear even as two persons died in a lightning strike in Uttar Pradesh’s Banda while a man drowned in Assam’s Karimganj district. 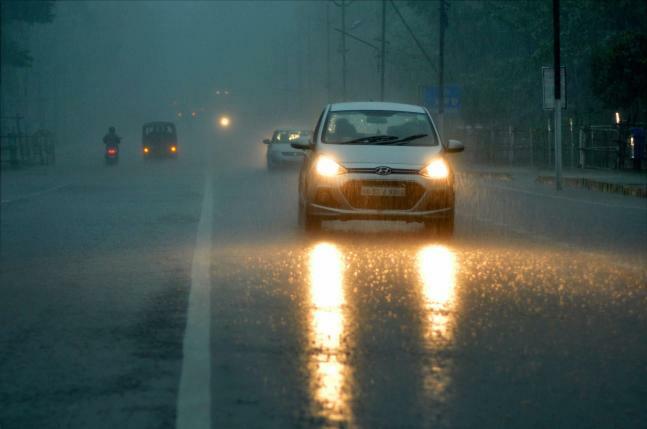 Rains continued to lash the national capital, which has received 191.9 mm of rainfall in June till now, the highest for the month in the last 10 years, leading to traffic snarls in some areas. The Safdarjung observatory, recording of which is considered official for the city, received 16.5 mm of rain till 8.30 AM and recorded 13.3 mm rainfall after that till 5.30 PM. The maximum temperature plunged to 31.1 degrees Celsius, six notches below the season’s average while the minimum temperature was recorded at 26.5 degrees Celsius, a notch below the normal. 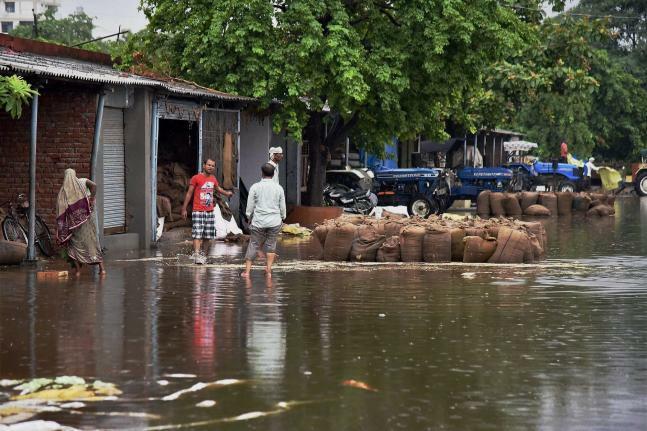 In Himachal Pradesh, widespread rains pounded several parts of the state, disrupting normal life even as the MeT department said monsoon would be delayed by another four to five days. Sharp showers have inundated the Beas river and its tributaries, prompting the administration to issue a warning to residents. Paonta Sahib was the wettest place in the region, gauging 124 mm of rainfall in the past 24 hours. Renuka recorded 54 mm of precipitation, Sangrah 49 mm, Kangra 39 mm, Kandaghat 32 mm, Dehragopipur 28 mm, Rajgarh 26 mm, Kheri and Saloni 24 mm each, Dharamshala 23 mm, Nahan 22 mm, and Manali 21 mm, Ghumarwin 20 mm, Bharwain 18 mm, Jubbal 17 mm, and Una, Ghamroor and Nagrota Surian 14 mm each. 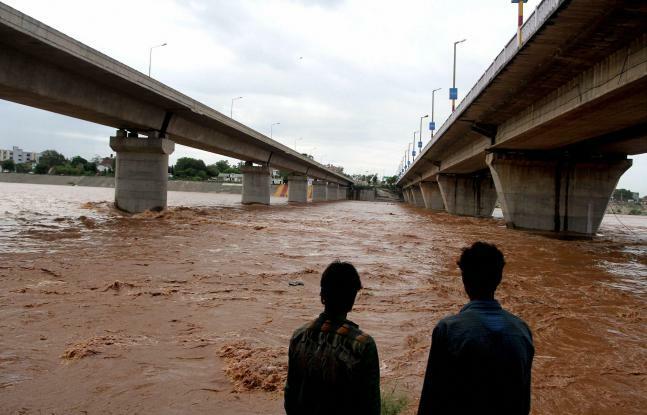 The southwest monsoon advanced into more parts of south Rajasthan, leading to heavy showers at several places in Ajmer. A fresh spell of rains drenched a few places in Jaipur, Udaipur, Jodhpur, Bharatpur and Kota. Barmer recorded 64 mm of rainfall, Pilani 20 mm, Churu 5.6 mm, Dabok 3 mm and Bikaner 2 mm. Back-to-back rains have led to a significant drop in the maximum temperature in the desert state, where the mercury normally soars up to 48 degrees Celsius in June.Most of the places in the state recorded their respective maximums in the mid-30s on Friday. Bikaner had a high of 37.5 degrees Celsius, Churu and Jaisalmer 37.2, Ganganagar 36, Jaipur 35.2 and Kota 34.2. The 300-km long Jammu-Srinagar national highway was closed for vehicular traffic due to blockade triggered by landslides in the Ramban and Udhampur districts of Jammu and Kashmir. 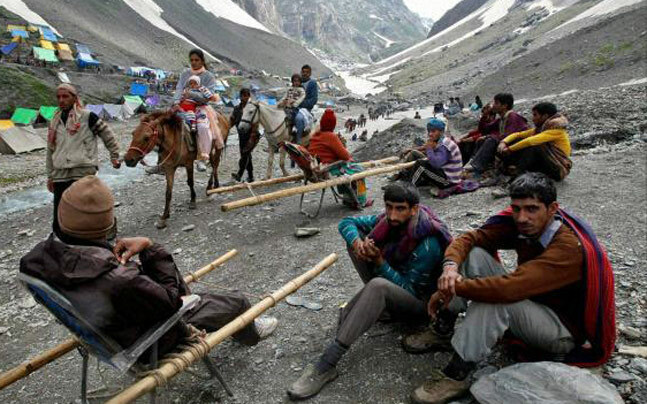 Amarnath yatra was suspended for a few hours on Friday due to heavy rains around the holy cave shrine in south Kashmir Himalayas it was later resumed from Pahalgam and Baltal routes. 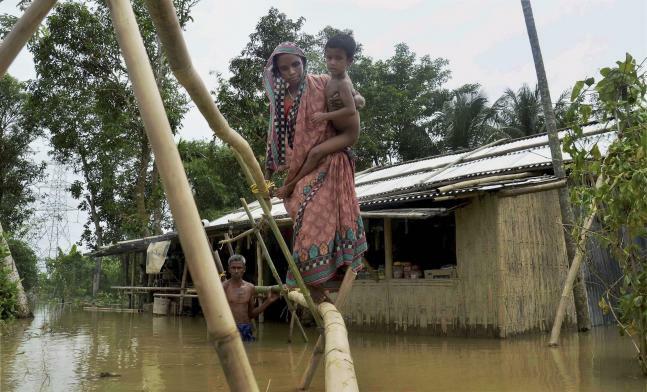 The floods in Assam claimed one life as over 1.52 lakh people of five districts were affected by overflowing waters of major rivers in Brahmaputra and Barak valleys. One person drowned in Karimganj, an Assam State Disaster Management Authority (ASDMA) flood bulletin said. Karimganj district is the worst hit in the current wave of flood affecting more than 1.35 lakh people and inundating 8,000 hectare of cropland. The other flood-hit districts are Lakhimpur, Sivasagar, Jorhat and Cachar. In Brahmaputra valley, Dhansiri river in Golaghat district, Jiabharali river in Sonitpur district and Barak and Kushiyara rivers in Karimganj district were flowing above the danger mark, the bulletin said. In Punjab and Haryana, moderate to heavy rains lashed most places, causing mercury to fall by up to ten notches. Ropar, Jalandhar, Amritsar, Phagwara, Ludhiana and Patiala, received moderate to heavy showers until early morning. 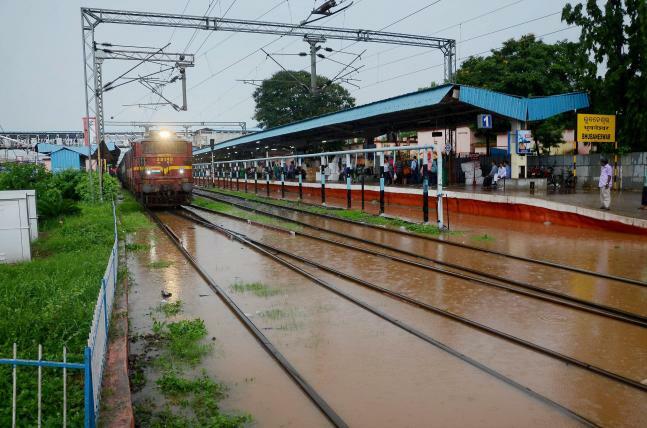 Most places in Haryana, including Ambala, Faridabad, Karnal, Kurukshetra, Panipat, Yamunanagar, were also lashed by rains, a MeT Department official said.The sky was partly cloudy in Chandigarh, the common capital of the two states, which received rains in the last two days. After the rains, maximum temperature at most places hovered between 27 to 33 degrees Celsius. In Bihar, light rainfall occurred in one or two places in its central parts, but the weather in the remaining part of the state was mainly dry. While light to moderate rainfall was recorded at one or two places in central part of the state in the past 24 hours, the remaining part was mainly dry. As per Met bulletin, Patna received 0.4 mm rainfall, whereas it registered 12.8 mm rainfall in the past 24 hours. Patna, the state capital, witnessed a humidity level of 94 per cent in the morning while it was 81 per cent in the evening, the bulletin said. 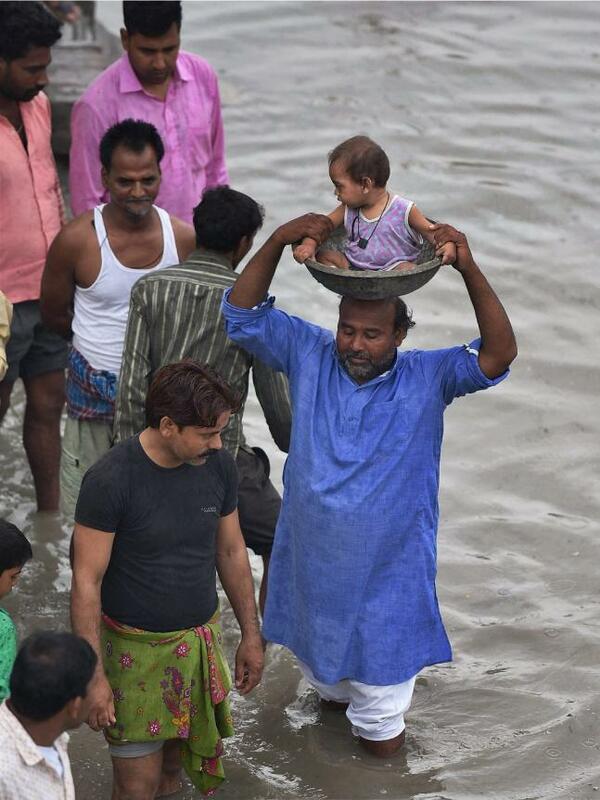 The highest maximum temperature recorded in the plains was 39 degrees Celsius at Varanasi of Uttar Pradesh. The weatherman predicted heavy to very heavy rain at a few places with extremely heavy rain at isolated places in Assam and Meghalaya and parts of West Bengal and Sikkim, Gujarat and Konkan and Goa.